Jennifer Miller has worked in the fitness industry for more than 20 years. She is a master trainer for the American Aerobics Association International/International Sports Medicine Association and owner of Jennifer Miller Fitness, a fitness education company. More than 15 years ago, she discovered Ashtanga Yoga by accident and fell in love with the athletic nature of the practice. She has been a student and teacher of Ashtanga since that time. 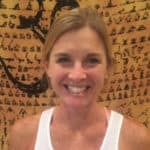 She is passionate about exercise and wellness and relies on her Yoga practice to keep her body strong and mobile. Jennifer has a Yoga Instructor Certification from the American Aerobics Association International/International Sports Medicine Association (AAAI/ISMA).